Nick Cave’s words have resonated with me since they perfectly describe my own feelings of that shimmering space. I call it the in-between land where, thanks to art-making, I have learned to live and thrive, to give myself the time I need to paint, write, experiment and find ways ‘to tempt the monster to the surface’. It is the place where many of us dip in and out afraid of lingering too long just in case but also impatient to visit again and again. It is a space both real and imagined, beautiful and terrifying. It’s the enchanted castle where to live happily ever after, the dark forest mysterious and scary, the mirage in the desert that promises rest and nourishment . It is quite daunting to enter that place and yet you know that eventually in you must go, in spite of the fear for the mystery that keeps us from exploring and from diving in fully. 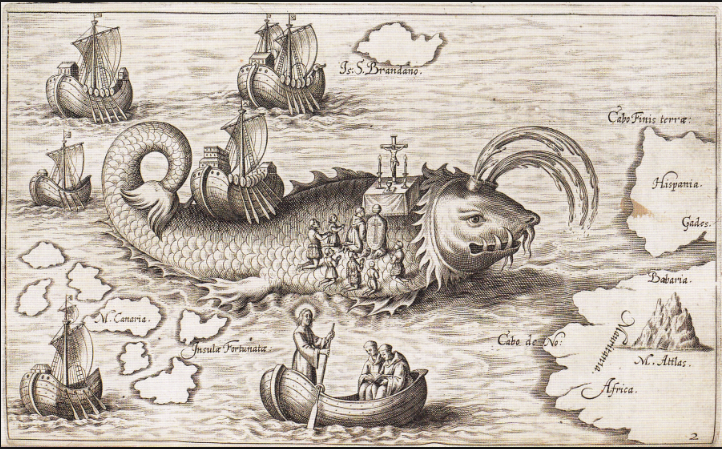 St. Brendan lands on a sea-monster island. Getting to know other artists’ work and learning the stories of their journeys reassure us that we are not alone, that others have been there before us and that others will follow. Other people’s artwork give us invaluable insights into their castles, forests, mirages and the images, music, poetry, novels, dances they bring back are the creations that they share with us. They are the result of those voyages, of the enchanting creatures and the monsters they have encountered and the fears and joys they have experienced. How we are going to face the new is a very personal choice but often and wisely we look up to role models for guidance and encouragement, sometimes not realising that they are ordinary people sitting beside us waiting for us to take the first step or to give us the badly needed push. That’s exactly what I was hoping for a few nights ago at a set dancing session in Kilfenora, County Clare. I was hoping that I could learn the steps just by watching the dancers while sitting on the bench lacking the courage to get onto the dance floor. Cowardly I was encouraging my guests to ‘get up and dance’ like the other foreigners who, with silly apologetic smiles and a body language that betrayed their discomfort, were nevertheless bravely hopping around. When towards the end of the evening the fiddle player announced the Siege of Ennis set, I turned to the local woman sitting beside me, who hadn’t missed a single dance, and told her how much I loved it. Are you going to dance it then? – she enquired, and to my negative answer she reacted by grabbing my hand and dragging me onto the floor. As the music started to play I found myself madly hopping (with a silly smile on my face), advancing and retreating, side stepping, ducking and then twirling, loosing my whereabouts and being promptly retrieved by my guide just in time to start all over again in a new line, facing new dancers and advancing again with military precision. Soon I forgot all about my fears lost as I was in that wonderful space where all love and tears exist and finally and simply I felt great. Vasilisa the Fair enters the forest. 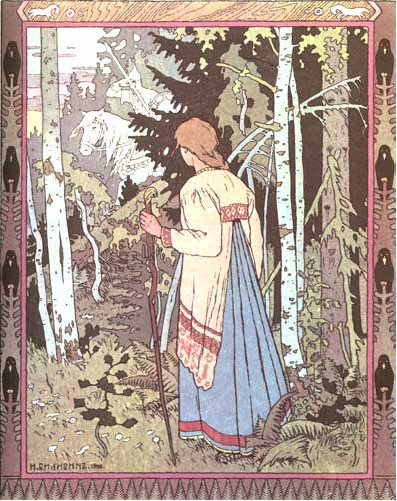 Russian fairy tale illustrated by Ivan Bilibin.